To register: http://conferences.iaia.org/mining18/registration.php. Registration closes 15 November 2018. A one-day training course will be held immediately prior to the symposium on 3 December: Key Concepts and Tools for Integrating Human Rights into Impact Assessment. Pre-registration and pre-payment by 15 November is required. IAIA is grateful to the following organizations who have pledged their financial and in-kind support of this symposium: European Bank for Reconstruction and Development (EBRD); Centerra Gold; ERM; Golder; Lydian Armenia; Intergovernmental Forum on Mining, Minerals, Metals, and Sustainable Development; SLR Consulting; AngloAmerican; and SRK Consulting. The preliminary program and registration information are now posted online. Rita R. Hamm IA Excellence Scholarship: This scholarship honors the legacy that IAIA’s former CEO has left on the organization and the field of impact assessment. One scholarship will be offered in conjunction with IAIA19, allowing a young practitioner in the region of the host country to attend. Potential candidates are those who have never attended an IAIA annual conference in the past and submitted an abstract to present a paper at IAIA19 by the 19 October abstract deadline. Full application instructions are posted at http://conferences.iaia.org/2019/rita-r-hamm-ia-excellence-scholarship.php. The application deadline is 25 November 2018. Students and young professionals bursary program: Up to 25 bursaries will be given to students and young professionals in the form of waived registration fees to attend IAIA19. The recipients are expected to cover all other costs associated with attending the conference. Potential candidates are those who have never before attended an IAIA annual conference, are 30 years of age or younger, and are either currently a student enrolled in an impact assessment or related undergraduate or graduate program OR are currently employed in the field of IA and living/working in a country listed under the World Bank’s GNI categories of low-income economies, lower-middle-income economies, and upper-middle-income economies. Full application instructions are posted at http://conferences.iaia.org/2019/students-and-young-professionals-bursary-program.php. The application deadline is 31 December 2018. Why is Brisbane talking about revolution? 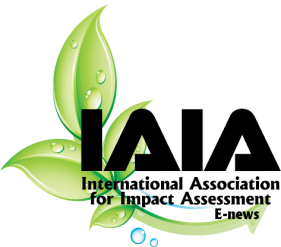 The IAIA19 Organizing Committee invites you to read their article, “Evolution or revolution: What’s next for impact assessment?” in IAIA’s journal, Impact Assessment and Project Appraisal, at www.tandfonline.com/doi/full/10.1080/14615517.2018.1516846. This article is free for anyone to access through 30 June 2019. Sponsorship opportunities are available for IAIA19. Download the sponsorship opportunities brochure to learn more about sponsor benefits and how you can make your company visible at IAIA19. And space is still available for exhibit booths and tables and other advertising opportunities. Visit http://conferences.iaia.org/2019/sponsors.php to download the IAIA19 Exhibitor Package. Thank you to the following organizations who have already committed to sponsor IAIA19: Tourism and Events Queensland; Brisbane Marketing, ExxonMobil PNG Limited, and Canadian Environmental Assessment Agency. FasTips No. 17 is now available! Download Induced Impacts for a quick and useful resource. The FasTips series helps to improve best practice by offering practical clarification on frequently-asked questions and is particularly helpful when there is no time for investigating or reviewing others' experience or formal guidance. Thanks to IAIA members Susie Brownlie, Liza van der Merwe, Nigel Roussouw, Ilse Aucamp, Jo Treweek, Asha Rajvanshi, and Francesca Viliani for their work on this document. Are you interested in hosting a future IAIA annual conference in your country? IAIA is now accepting bids to host IAIA21 and IAIA22. The Board evaluates many factors including location; proposed theme in relation to the IAIA mission, vision and values; quality of the proposal; and potential financial outcome. Contact Jennifer Howell at IAIA HQ (jen@iaia.org) to express your interest and receive information on preparing an effective proposal. IAIA has recently changed banks. If you have IAIA banking details stored in your accounting system for wire transfers, please contact Sue (info@iaia.org) for IAIA’s updated information. IAIAsa (KwaZulu Natal Branch): “Carbon Management and Reporting,” 20 November 2018. See http://www.iaiasa.co.za/EventOrganisers/EventDetails.aspx?eeid=33654 for more information. IAIAsa (Western Cape Branch): Western Cape Branch Event. See http://www.iaiasa.co.za/EventOrganisers/EventDetails.aspx?eeid=33655 for more information. New Zealand Association for Impact Assessment's (NZAIA) annual conference, ​​"UnIntended Consequences: Impact Assessment for Sustainable Regional Futures," will be held 28-29 November in Hawke's Bay, New Zealand. See the NZAIA web site for more information. Association québécoise pour l'évaluation d'impacts (AQEI)—6 December webinar, “Les droits de la personne dans les études d'impacts” (human rights in impact studies). See https://www.aqei.qc.ca/events?id=685 for more information and to register.